A vitamin that is a source of antioxidants for the maintenance of good health and promotes a healthy glucose metabolism. 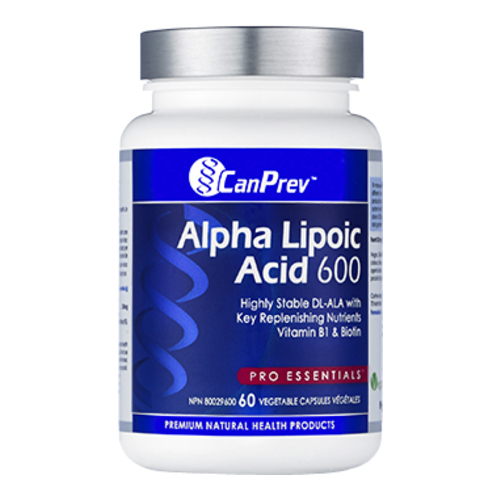 Alpha Lipoic Acid 600 provides a therapeutic 600 mg dose of a safe and stable form of ALA. The formula is supported with thiamine and biotin, as these nutrients, in particular, are required to absorb high doses of ALA. ALA helps to metabolize carbohydrates, promotes healthy glucose metabolism and is a powerful antioxidant for maintaining good health. Adults - Take 1 capsule per day or as directed by a healthcare practitioner.